Neurosis is a very fun and interesting matching puzzle game with some unique rules. 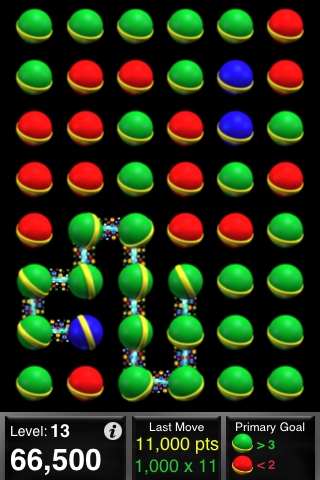 The goal of the game is to create a connection between two blue puzzle pieces, but you have to watch the minimum and maximum requirements for the green and red puzzle piece connections! You need to have less than the minimum connections to red pieces, while trying to connect as many of the green pieces as possible to score extra points. This sounds simple, but Neurosis has tons to offer in both replay value, as you try to unlock all of the achievements for a level, and there are also 100 levels! I found this to be a really fun puzzler that has a nice twist to the normal connection type games. The graphics, animations, and sound effects are great. The menu system is very intuitive and the achievement system is very well done. Neurosis is easily worth the $1.99 price and will keep you happily playing for a long time!